Brian L. Frye, Spears-Gilbert Associate Professor of Law at the University of Kentucky College of Law, recently returned from China where he taught a three-week class on United States Intellectual Property law at the Jilin University School of Law, one of the top law schools in China. “It was an amazing experience to have young Chinese students who were so excited about learning intellectual property law,” said Prof. Frye. In May and June, Prof. Frye embarked on his third trip to China with a group of 12 faculty members from various colleges at UK. During his visit, he taught about 35 Chinese students, some of whom were enrolled in his class and others who were auditing it. About 75% percent of the students were law students, and the remainder were studying other disciplines, like philosophy or criminology. Because Prof. Frye was told it would be difficult for the students to read and understand entire United States judicial opinions, especially given the brief duration of the class, he prepared a 64-page reader briefly explaining the various theories of intellectual property and each of the important intellectual property doctrines. Rather than including excerpts from cases, like in a traditional law school casebook, he provided summaries. The reader is available for download here. Teaching students for whom English is a second language was a different experience for Prof. Frye. He learned to speak more slowly and clearly, in order to help his students better understand him, especially those with lesser English language skills. In addition, China is a civil law country, in which judges play a somewhat different institutional role than in the U.S., which affected how students understood judicial opinions. After class, students approached Prof. Frye to ask further questions. They also sent long emails full of their observations. He also connected with many Chinese students on the popular Chinese social media app WeChat, where they asked more questions, as well as made suggestions on where to go and what to see in northeast China. During his free time, Prof. Frye visited Nanhu Park, the Puppet Emperor’s palace, the zoo and botanical garden, and Jingyuetan Park. He also walked to Guilin Lu or “Street,” a popular shopping district with lots of street vendors. In addition, he searched for Chinese records, with the help of his students. On June 14, Prof. Frye presented a radio program of those records, as well as suggestions from his students, on WRFL 88.1 fm Lexington. For their examination in the class, Prof. Frye gave the students a selection of open-ended questions about different categories of intellectual property, and asked them to write an approximately one-page answer to one of the questions. “Their responses were remarkably thoughtful and reflected real engagement with the subject matter we discussed in class. I just can’t emphasize enough how impressed I was with my Chinese students,” he said. 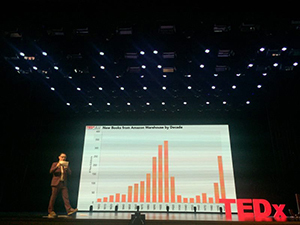 In addition to teaching, Prof. Frye gave a TEDxJLU lecture to approximately 1,000 Chinese students, titled “Extremum as Metaphor.” In his talk, he made observations about the relationship between innovation and intellectual property, and suggested that China could improve its intellectual property policies by being open to, but skeptical of, suggestions from other countries, like the U.S. Towards the end of the trip, Prof. Frye visited Shenyang, in neighboring Liaoning Province, as a guest of the United States Consulate. The cultural affairs staff at the Consulate arranged several events in both Shenyang and Changchun for him. Prof. Frye spoke on intellectual property at the Northeastern University School of Law and the Shenyang Conservatory of Music. He also met with a group of Chinese intellectual property lawyers and presented a screening of his documentary film, “Our Nixon.” In addition, he presented a screening of “Our Nixon” at Jilin Animation Institute in Changchun for 270 members of the general public. Following the screenings, he engaged in follow-up discussions on filmmaking, privacy laws, and American politics. “I really appreciate all the work the cultural affairs staff at the Consulate did to arrange talks and meetings with Chinese students and lawyers,” Prof. Frye said. Over the course of a month, Prof. Frye made friends with many students and faculty members at the Jilin University School of Law. “I hope to maintain those friendships and establish a connection between UK College of Law and the Jilin University School of Law,” he said.